Disclosure: We are an independently owned professional review site and we receive compensation from the companies whose products we review. We give give high marks to the products we believe are the best in their class. The opinions expressed here are our own. This 2012 model robot is great fun for all ages. Measuring about 15 inches high, it's the perfect gift for the robotic enthusiast. 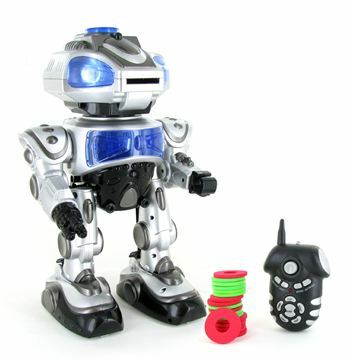 This robot is fully programmable with 11 different commands from the remote control unit. It dances,his body turns left and right, he walks, and his eyes and body light up. In stock now for immediate shipping - order yours TODAY!